How recent changes in crowdfunding regulations have opened up new opportunities for investors and small to mid-sized companies to efficiently raise capital. To understand the significance of equity crowdfunding including recent changes that will have a huge impact on the investment marketplace for investors and early-stage companies alike, we must first acknowledge the specific constraints on capital formation stemming from the Securities Act of 1933 that equity crowdfunding seeks to address. At the same time, we should be aware that the latest key installment of these sweeping regulations, Title III of the JOBS Act, only took effect in May 2016. 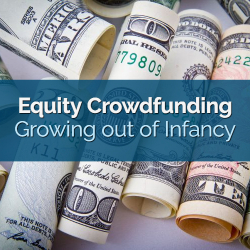 Equity crowdfunding is still in its infancy and we have we have only just begun to see the potential impacts that recent regulatory changes will have for startups and in the venture capital industry. The JOBS Act has several provisions that make it easier for today’s entrepreneurs to raise money. Title II of the Jobs Act made it possible for companies to solicit the general public for investment capital for the first time in 80 years. This change finally made it legal for startups and smaller early stage companies to actively solicit business by way of advertising to the public rather than being limited to dealing with investors with whom they had a pre-existing relationship. Real estate investment crowdfunding was the first industry to really embrace this new investment class. Early crowdfunding platforms like OurCrowd took the opportunity to jumpstart an entirely new industry, and others like “Patch of Land” reported having facilitated more than 500 investments totaling over $300 million. Others in this early-lucrative niche include EarlyShares on the commercial real estate side, and PeerRealty which specializes in multi-family residential real estate. Already, the largest crowdfunding portals represent almost every major industry – from residential and commercial real estate, to high-tech, innovative consumer products, and now the multi-trillion dollar energy industry with the recent Reg CF approval of EnergyFunders.com in January of 2018. It wasn’t until Title III of the JOBS Act was enacted, however, that equity crowdfunding actually opened the doors allowing non-accredited investors to buy private securities alongside their more financially-empowered accredited counterparts. The welcoming of non-accredited investors to the table represents the formation of an entirely new revenue class to provide financing for entrepreneurs. There really is no limit to the number or scope of opportunities that will be made available over the next several years. Opportunities that had been formerly available only to those with the right connections and financial qualifications have just been opened up to investors large and small. Equity crowdfunding platforms are providing access for startups to reach thousands of potential investors all at once, as they are now available to be legally advertised to accredited and non-accredited investors alike. The SEC has brought more than a dash of equality into the investing world recently. While the barriers to wealth creation are not disappearing, they are undergoing substantial reductions. Due diligence and solid information gathering are critical. It’s incumbent on the crowdfunding platforms to provide transparent information about the officers and each company’s background and business. As always, it’s up to each investor to do their homework. Investor eligibility and minimum investments vary tremendously from one platform to another. Each equity crowdfunding platform may offer a slightly or dramatically different model depending on the rules which they utilize. Some take pledges, others act as intermediaries between investors and companies, and others act as issuers. One of the largest equity crowdfunding platforms, AngelList, operates funds that own shares in multiple companies or across asset classes. Some of their “deal by deal investments” and funds have hefty minimum investments that effectively put participation out of reach for the average investor, while others like SeedInvest and EnergyFunders offer lower thresholds to entry. Powered by the internet and the ubiquitous age of social media, equity crowdfunding’s evolution is inevitable. The category has certainly seen its share of winners and losers, and social media makes it easier to connect investors with capital while platforms provide the access. Platform-specific projects and niches are popping up everywhere and the industry is just getting started. As the world changes, the variety of investment opportunities will continue to evolve and shift, but that doesn’t mean the onus of due diligence is removed from the shoulders of the investor. It does mean that the investment marketplace will continue to diversify and provide more opportunities to assemble a diversified portfolio even as it allows access to any number of potential grand slam startups, innovative technologies, and even new ways to lend a hand to important social and humanitarian causes. The first time the word crowdfunding used under its current definition was in a 2006 blog, an incredibly recent birth for an industry projected to be worth $96bn by 2025. In the years since that first post, platforms such as Kickstarter have become leaders in the industry for filmmakers, artists, and aspiring creatives who see it as an alternative to the “traditional route” of financing through investors. Because of this adoption by the greater artistic community, many skeptics view crowdfunding as something done out of necessity, however, I disagree. 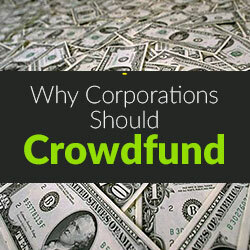 I see crowdfunding as a strategy to scale a corporate brand by leveraging the community in a new, creative way. Engaging the audience, increasing brand awareness, driving press, and – last but not least – raising money. Additionally, I don’t feel that this is a new concept but rather has been used successfully by generations of marketers and outside-the-box thinkers. In 1885, when the Statue of Liberty arrived in New York, it still didn’t have a pedestal to stand on. Not only did the pedestal not exist, the $250,000 needed to build the pedestal had only been partially raised. The city of New York didn’t want to put up the funds and other cities would only ante up if the statue came to them. That’s when Joseph Pulitzer of the New York World saw an opportunity. Using his newspaper for promotion, Pulitzer turned to the public and raised $101,091 for the development of the pedestal. The money came from everywhere and everyone. For example the mayor of Buffalo donated his entire annual salary while Philip Bender, his wife Eliza, and their eight children pooled their money and donated $2.65, the smallest children donating $.10 each. It wasn’t necessarily about the money, it was about being a part of something bigger. In fact, 75% of the donations were less than $1 but each donation counted and in return, each donor was given a reward such as a statuette of Liberty, a gold coin, or their name in the newspaper. Yes, in essence, the Statue of Liberty is standing in New York today because a large, established brand, made the decision to forego the traditional routes of financing and target the end users who were emotionally engaged in reaping the benefits of a successful campaign. What did The World get out of it? A lot. The campaign became front page news and led to additional campaigns, business deals, and an increase in brand awareness exponentially greater than if Pulitzer had simply paid the $100K out of his own pocket. The World was seen as a patriotic organization looking out for the good of New Yorkers even though, in reality, Pulitzer simply focused his influence in one particular cause that, on the surface, had no direct correlation to the publishing industry. Corporations today can learn a lot from Pulitzer’s strategy. The hardest part of running a crowdfunding campaign is building the audience, however, if your brand already has such an audience, it might be time to think about putting that power to work. At FilmBreak we specialize in finding creative ways to engage the audience, often driving that community to an owned-and-operated website that functions similarly to a crowdfunding platform, but is completely built to align with the company’s current brand and message. Campaigns like this can take many forms from a straightforward crowdsourced website like Change the Course to a full, multi-media crowdsourced campaign like the now-famous Doritos “Crash the Super Bowl” ads. Whether it’s a Kickstarter campaign, a custom website, or an enormous multi-media effort, at the core, they all have the same mission: Leveraging an existing community to take an action that helps both the user and the brand in a unique way. So the question becomes, was this the case before the social media generation? How did Joseph Pulitzer address these three elements and can we draw a parallel between the successful Statue of Liberty campaign and modern day successes? Stripped down, the similarities are striking and, whether consciously or otherwise, Mr. Pulitzer nailed each element right on the head. He gave the public an opportunity to get directly involved with the development of an enormous public works project that had never been done before; he accepted contributions of any amount and rewarded the donor with the priceless satisfaction of seeing their name in The World; and the result changed the New York City skyline and has become a symbol for freedom and liberty worldwide. One. Two. Three. Your campaign might not be to the scope of Pulitzer’s and it doesn’t have to be, but every corporation can benefit from developing and emotionally engaging their community through the strategy of crowdfunding – tried, tested, and proving over the last 150 years. If you’re ready to take the next steps, see my previous post on how to prepare your campaign for launch. 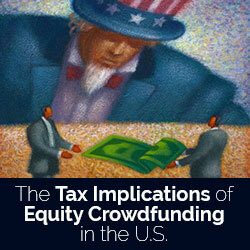 The Tax Implications of Equity Crowdfunding in the U.S.
With the new crowdfunding rules taking effect in May of 2016, many are anticipating a groundswell of interest in early stage investing. Before you jump in as an investor, however, make sure you understand the implications — especially when it comes to taxes. There are a few things you want to consider before investing, including the types of company structures you can invest in through crowdfunding, the vehicles you can invest through, and how the U.S. Tax Code applies to both the company structure and the investment vehicle. There are many moving parts involved in the U.S. tax system. Interaction between these parts is where many of these complexities arise. Due to the geographical range of investors and the associated complexities with countries and states’ different tax regimes, this article will solely cover parts of the U.S. federal tax system as it relates to crowdfunding startups. Corporate structure is the first thing you want to note as an investor. There are two types of corporations that are most common: Limited Liability Company (LLC) and C-Corporation (C-Corp). There are also S-Corporations, however, new S-Corporations are rare since the establishment of the LLC. Both types of incorporations protect individuals from liability, but differ when it comes to the tax implications. An LLC is a pass-through entity, meaning that all gains and losses sustained by the company are “passed through” to the partners (including the investors) in the company. This means you will pay or deduct the taxes on your personal return at your marginal rate. Also, all partners in an LLC are “equal”– as in there is no legal difference between the first investors and the most recent. Lastly, all investors in the LLC may be required to file income tax returns in any state where the company does business, which can be a hassle. A C-Corp also provides protection against individual liability. C-Corps have an advantage for startups in that they allow for different classes of shares to be sold, most often preferred vs. common. This is one of the reasons it is rare for a VC or large professional firm to invest in an LLC. Additionally, there is a specific provision in the U.S. Tax Code, Section 1202, that is only applicable to a C-Corp. Section 1202 will be discussed in more detail below. One major disadvantage of a C-Corp is double taxation. If the business is profitable, the company pays a first tax on its profits. Then, if it distributes those profits to its investors, they again pay a tax on those profits. This is often not an issue for a high-growth business that is spending more than its revenue. These losses are held by the company to be used to offset the C-Corp’s income in the future. Personal Investment – A personal investment from a brokerage or a bank account is thought to be the most common way for crowdfunding investors to invest. It is the quickest and easiest to complete and has the least hassles (dealing with fewest investment institutions, fewest forms, etc.). Trusts – Trusts are often used for investments and allow for one generation to protect, control, and pass assets to future generations without invoking the estate tax – a big advantage. IRAs – The standard benefits of IRAs also apply when they invest in startups. Gains are tax-free until withdrawn, allowing for compounding interest without capital gains taxation (Roth IRAs are currently tax-free even when withdrawing). However, using an IRA to invest in a small company or startup often requires a substantial amount of time and effort, and the brokerage fees can be quite high. Most large brokerage houses will not permit investments in startups through an IRA, and the IRA must be transferred to a smaller company that will allow the investment to be made. The U.S. Congress has decided that encouraging investment in small, new companies is a worthwhile activity. Thus, they have added sections to the tax code to encourage investment in smaller companies. Three of the main sections that an investor can often use when investing in small, crowd-funded companies are Sections 1045, 1202, and 1244. When possible, applying Sections 1045 and 1202 to your investments is most advantageous. Section 1045 allows for the profit from certain qualified small business investments to be rolled over into new investments in qualified small businesses – allowing the investor to not pay taxes for the first investment. Section 1202 allows for investments from certain qualified small business investments to be sold tax-free up to a value of $10 million. There are a number of qualifications that must be met for Section 1202 to be used, which I detail in this Section 1202 focused article but if it can be applied, it is extremely lucrative. Under certain circumstances, Section 1244 allows an investor to deduct up to $50,000 from a loss in an investment to be applied to the investor’s tax return as an ordinary loss instead of a capital loss. This may be met when investing in a crowd-funded business. This is important because capital losses receive different tax treatment than ordinary losses. Capital losses can only be used to offset capital gains, which are taxed at a lower rate than ordinary income. Ordinary losses can be used to offset ordinary income, which is taxed at a higher rate. Investing in small businesses is inherently risky, as I outline in the article How to Become an Angel Investor. As always, an investor should be prepared (mentally and economically) to lose everything in a startup investment. There are many things that an investor should keep in mind when investing in early stage startups. As always, consult with your financial and tax advisors when undertaking angel investing to know how these rules can be applied to your personal situation. The information given here is meant to be informational only – it holds no legal weight. You’ve completed your design, you have your samples in hand, and now you need the funds to start that minimum quantity order (MOQ) with your manufacturer. You’ve decided to go the crowdfunding route. Good question. I just completed my first crowdfunding campaign, and though I didn’t set any records, I reached 150% of my goal and now have over 150 customers eagerly awaiting my product. And frankly, I’m eager to do it again. The process wasn’t exactly easy though, and I spent a tremendous amount of time researching, reading, and listening to everything I could in order to learn from the mistakes of others, and to make sure I gave my campaign the best chance of success. 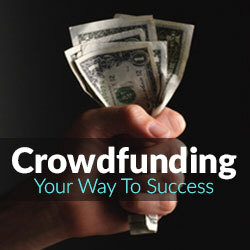 Here’s how you can set yourself up for crowdfunding success. First and foremost, the #1 thing you need to start doing now is to create a social media presence by sending out interesting (and related) articles, photos, and links via Twitter, Twitter, Facebook, Pinterest, and Instagram. Ideally, you should start this 2-3 months before your campaign launch date. Building your social media accounts is relatively easy, but it’s probably not the best use of your time. There a lot of people skilled at social media, so consider instead hiring an inexpensive virtual assistant, enlisting a college student, or even hiring a friend’s teenager. Concentrate your time and effort on the important things that only you can do. Target your audience carefully. Know who your backers are and spend the majority of your time finding and reaching out to them. They will be your most enthusiastic fans and will help you the most in your campaign. Your best media contacts will be bloggers in your product field, national media outlets that have covered similar campaigns, and even local reporters who like to showcase successful new businesses. Find a “champion” – someone who really believes in your project, who has a wide reach of contacts, and who is willing to help you succeed. Your champion will do a lot of the heavy lifting on your marketing in a way only he/she can – all because they believe in you – so treat them well. Don’t “pitch” your product to them – present them with story angles to choose from that will appeal to their particular writing style and audience. You want them to have to do as little work as possible. Give them a story and headline they can get excited about writing. Mention one of their articles and why you liked. Share their links, and comment on their work to let them know you’ve been following them and that you are familiar with the kind of material they put out. Prove you’re interested in their work and not just contacting them out of the blue because you want something. Be friendly, funny, and make it clear you’re looking for long-term contact. Ask how you can help them. Be willing to send them product samples if possible. If it’s not possible, send them the pre-launch link so they can see your idea in action. Keep in contact with them after the campaign ends. You’re developing real, long-lasting relationships, not just tapping them whenever you need something. Thumbnail – Use an image that you want to be the face of your project. It should be eye-catching because this is what your backers will see first when searching through projects. Title – Come up with a title for your project that immediately grabs your backer’s attention. Short Description – Write a 1-2 sentence description that summarizes the most important benefits of your project. They should make your backer want to know more. Video – The video is a vital part of your campaign. Show what problem your product solves. Show the product in action – the video needs to show your backers what’s your product is like since they can’t see, hold, touch, smell, or taste it. Show why viewers want your product. What will it do for them? Call to Action – Don’t forget to actually ask them for help. This may seem obvious, but never assume they know what to do. Tell them exactly what you need and how to support you. Rewards – Keep in mind that most backers just want your product. Offer your product at the lowest possible price, or potential supporters will just wait until it’s available elsewhere. And if they support you now and find it for less money later, you’ll lose their trust – and they won’t be coming back for your future campaigns. Offer something for free. This is highly appealing to backers and they’ll be more likely to share your campaign if they receive something for free. Offer a low $1-5 reward as well, for those who just want to help and be a part of the process. Try to keep one Reward around $25, since this tends to be the sweet spot for crowdfunding campaigns. Have a high-end reward – just in case someone really does choose it. Make it worth it and someone will. Figure your shipping costs carefully, especially for international backers. State the shipping costs up front so backers aren’t surprised AFTER they’ve pledged. Put a lot of thought into your Rewards. You can always add more Rewards later, but you can’t change or remove a Reward once someone has selected it. Only offer a few Rewards, and keep levels simple and clear. 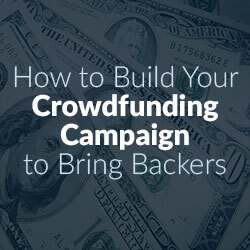 The more complicated or confusing they are, the more potential backers you’ll lose. Infographic – Place one in the copy so backers and quickly and easily see the rewards and can make their choice faster. “As Seen On” Section – Put logos of media outlets who have showcased your project – those are your best and most trusted social proof examples for backers. Testimonials – Include some quotes from people who have seen, used, experienced, and approve of your project. If possible, include links to where they were seen/posted/tweeted, etc. This is the area of the campaign copy/description where you’ll include information not covered in your video. Tell the story behind how you came up with your project. Show early prototypes and sketches. You want supporters to understand the amount of time and effort you put into it. Give your project some character, some sense of you, your outlook on life, your sense of humor. Don’t be afraid to also show your failures, and how you resolved them to make your product even better than before. Have fun with it. This is your chance to shine and to get people excited about your project. Include a lot of images. Use bullet points to break up the text and highlight main points. 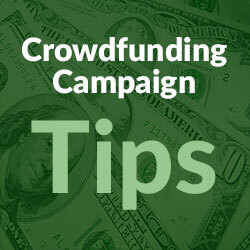 You want backers to comment on and interact with your campaign since active backers affect a crowdfunding site’s algorithm, which helps boost your ranking on the site. Because backers and potential backers can be very verbal about what they do and don’t like about your product, this is a vital time to consider changes or improvements to your product – before the manufacturing process begins. Take it all with a grain of salt, and stay true to your style and vision, but be open to ways to improve on your creation and how to satisfy future customers. During the campaign, send updates when you have something important to say, when you reach milestones, when you need help spreading the word, and when it’s the “last call” push at the end of the campaign. But don’t spam them. After the campaign, send updates regularly to keep backers included in the process. Attach a lot of photos of the process whenever possible. Backers can get very unhappy if you keep them in the dark, don’t fulfill your promises, and don’t meet your deadlines. Even if your campaign fails to reach its funding goal, you’ll have the chance to link it to a capture page for those who missed the campaign but are still interested, or for those who want to know when you’ll try again. Use it to help potential customers find you, and stay in touch with those who supported you. I didn’t know about some of these campaign elements until just before I was planning to launch my own campaign, but I scrambled like mad and was ultimately successful. So plan your steps, take it one step at a time, and just keep moving. Good luck!